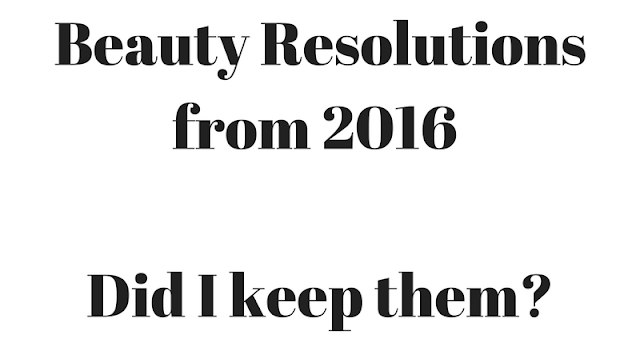 Beauty Under 10 | Beauty should only take 10 minutes Beauty Resolutions 2016 – Did I keep them? Beauty Resolutions 2016 – Did I keep them? When I was thinking of what beauty resolutions I would have going into 2018I wanted to look back and see what resolutions I had last year and if I actually kept them. In my blog post Beauty New Year's Resolutions for 2016, I listed some beauty resolutions I wanted to work on. I haven’t thought about them since the first part of the year. Let’s see if I stuck to them or not. I actually did cut back on heat styling!! I’ve gotten better at this, I don’t remember to do it all the time but most nights I am removing my makeup once I get home. I recently went to the dentist for a check-up and NO I did not keep this one consistent. I’m not sure why but this has always been a hard habit for me to get into. I still use drugstore brands but have added more organic products to my collection. Pur Attitude is my favorite skincare line right now! I am surprised by this one, I forgot about it. I do give my nails a break once in a while to get nourished and replenished. Not as often as I should but better than when I wrote this 2016 blog post. I’m pretty impressed! I thought I would have had “NO’s” across every resolution. What were your beauty resolutions last year? Did you keep them?